A wonderful presentation of the 2 week project with DC’s Summer Youth and the Office of Planning! Thanks goes out to THEARC and Scott Kratz for assisting with the 11th Street Bridge project. This summer a new outdoor track cycling arena will open on Buzzard Point and will be host to major racing events, cycling courses for kids and adult riders, as well as free fitness programming for the community. 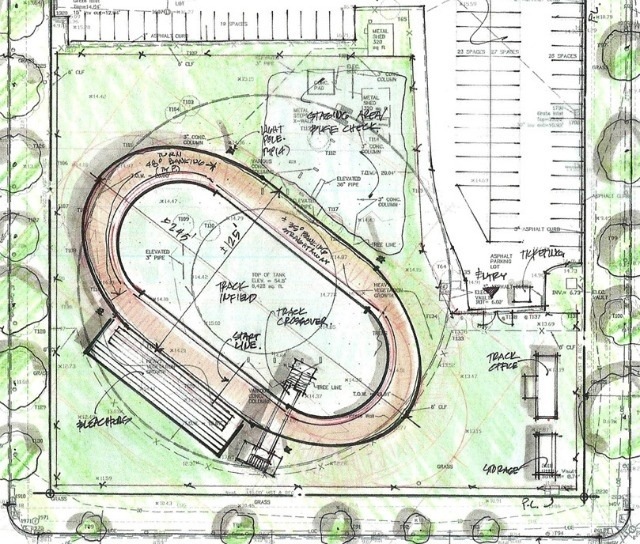 Headed by a non-profit group, DC Velodrome, the track will be located between T and V Streets and First and Second Streets, SW, four blocks southwest of Nationals Park on a 1.5 acre parcel of land leased from Akridge. It will be the 27th Velodrome to open in the U.S., and will serve as a site for pro-level races in the District, and also as a community asset to neighborhood residents. DC Velodrome’s initial plans include the assembly of a portable cycle track that is 544 feet in circumference, a small grandstand for spectators, lighting, locker rooms, a snack bar, and parking. According to DC Velodrome, “the track can accommodate 12-15 riders for youth and adult classes and as many as 24 licensed or more experienced riders at one time. Typically races will be run with 12-16 riders. A fleet of Fuji track bikes and Bell helmets will be available for beginners at no charge in our basic and advanced classes, fitness sessions, and for rent to others during scheduled training hours.” DC Velodrome is funded entirely by private sponsorships and donations. More information can be found here . This evening’s monthly SWNA meeting was a presentation of the Stage Two PUD for phase I of development at the Southwest Waterfront called The Wharf by the Hoffman-Madison Waterfront team. The presentation was held in the Kreeger Theater at Arena Stage. At the presentation, the developers and master planner gave a description of what is planned for parcels 2, 3, 4, 11, and public places including District Pier, Transit Pier, Waterfront Park, and 7th Street Park. The Stage Two PUD application was submitted to the Zoning Commission on February 3rd. A description of what’s planned for the parcels can be found here. via Southwest…The Little Quadrant That Could: Wharf PUD Presentation Recap.